The 69th League of American Orchestras National Conference in Seattle is the place to be June 4-6, 2014. Everyone has critical questions to be asked, and the Conference is offering countless solutions to these questions. As a volunteer you will have the opportunity to participate in a very worthwhile and informative track created just for the volunteer constituency. A full schedule of networking and interactive sessions will give volunteers the chance to share and grow at Conference, and attending a performance of the Seattle Symphony at Benaroya Hall is sure to be wonderful. Please take the time to peruse the Conference information below, along with the League’s Conference website, and plan to join us in Seattle. I promise you will go home motivated and inspired. National Volunteer Week is April 6-12, 2014. This week celebrates people doing extraordinary things through service. Thank you symphony volunteers for your extraordinary service. Though my term as President does not end until June 30th, this will be the last issue of Volunteer Notes before then. It has indeed been an honor to serve as president of the Volunteer Council this year. I have had the privilege to serve with a group who possess vision and a call to action. The dedication exhibited by the Volunteer Council and the League staff assures the future of symphony music. My special thanks to Samara Ungar, Polly Kahn, and Jesse Rosen for their support and guidance this past year. Boost Your I.Q. * – Join Us at Conference! At this year’s League of American Orchestras National Conference in Seattle, you’ll discover a world of sharing – the successes, the challenges, the solutions. Every year, the best and brightest volunteer organizations across North America gather together for three days of collaboration on what’s worked, what’s wowed, and what’s next. Conference offerings will include nine Gold Book Award of Excellence presentations in two interactive sessions, plus the ever popular Roundtable expo-style session. This year, 15 projects will be offered (see article below). In addition, the League’s Volunteer Council will host two tables highlighting League online resources and services for volunteers. Remember – the 2014 League of American Orchestras Conference dates are Wednesday June 4 through Friday, June 6 in Seattle. Registration is now open on the League’s Conference site (early-bird registration closes on April 25th). We’ll see you there! A Record Breaking Number of Roundtables in Seattle! Seventeen Roundtable sessions will be offered to the 2014 Conference attendees. The subjects are varied and sure to provide a new idea for your organization or a face-lift to an existing project. Learn how knowledgeable guest speakers can present a short seminar to your volunteer officers on fundraising or strategic planning…for free. Add a new twist to your Young Artist Competition. Learn about several successful fundraisers that were specifically targeted to attract younger volunteers! Rebranding your volunteer organization? Learn how one volunteer organization accomplished this project. Conduct a growing symphony by partnering with a local nursery, and raising money with every new flower/sculpture purchased.Halloween Haunt and the Symphony… provide a memorable experience for 8,000 children. Fundraising for the symphony is one of the main goals of many volunteer associations. Adding to the ideas or thinking “outside the box” is something volunteers are always interested in doing. Below are a few ideas you may want to use if your organization is planning an event in the future. Before the event, keep those emails going… Emails are a great way to encourage people to send in their reservations and/or put a table together, to notify if the event is almost sold out, and to let all know once again what to look forward to in the way of entertainment. It is important that the invitees know the association is looking forward to seeing them at the event. Publicize, publicize, publicize! Do a little something special to set the Underwriting Tables apart from the regular tables. This makes donors feel special, gives them status, and encourages underwriting for the next year, as patrons will remember their table was outstanding. Greet guests at the door with a beverage before the check-in table. Have a photographer taking pictures of guests as they enter. If raffle tickets are sold at the event, put a sticker on the lapel to show the person has purchased a ticket. During the event, have a few volunteers, carrying baskets with helium balloons tied to them for easy spotting, walk around to tables looking for guests without a sticker to solicit a ticket purchase and give them a sticker if they do. If you have a live auction chair or reservation chair, here is an “out of the box” suggestion. Put your conductor’s voice on your voicemail stating “This is Conductor ____________of the ___________________Symphony. Mrs. _____________ is not available to take your call. At the sound of the tone, please leave your name and number.” This would bring added interest to the event. Email information about auction items before event to build up interest. Have auction rules included in the program book. Announce time left before silent auction ends-15 minutes, 5 minutes. Encourage last minute bidding. Mystery boxes for sale at the event all wrapped alike –for example 75 boxes at $75 each. All boxes contain gift certificates to a store and one contains a gift valued at $5,000 (any amount) donated by the store. The store needs to underwrite the boxes. Go into an event with as many expenses underwritten as possible. At the beginning, committee members need to work on finding underwriters for invitations, valet parking, centerpieces and anything related to the event that is an expense. Give these underwriters publicity in your newsletter, at meetings, and at the event. No matter the size of the organization, the rules for fundraising are the same. Lesson 1) Colorful and fun. 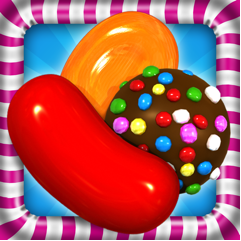 The game builds on something colorful, familiar, engaging, and fun -- candy. We may not want to use candy in all our events, but why not use color and fun themes in all of our programs to invite and engage? Lesson 2) Something new each round of the game. Boredom never sets in because there is always something new. While we like the “tried and true”, we should think about something new to refresh our repeated programs -- the promise of a new twist for people to look forward to and to inject an element of surprise can be very appealing. Lesson 3) Challenging and rewarding. Give people a challenge to rise up and reward them for their success. This is perhaps more for our volunteers than our audiences, but very important to success. Perhaps with a little more thought, you can think of ways to make this work for fundraising events or education projects. Lesson 4) Share with friends. Candy Crush recognizes our desire to share what we are doing with friends and socialize. So embedded in this solitary computer game is the notion of sharing. We need to always encourage our audience to share their experiences with us and within their circle of friends. Encourage people to host a table of friends at events, write about their experience at an event on Facebook or other social media, and invite new people via an online invitation. Lesson 5) Online community for help. Many websites and blogs offer help to the weary Candy Crush player who needs help getting to the next level. How often do you reach out to others via the internet for help getting to the next level of raising money? One such resource is the League’s online discussion group League 360. Post a question and get a helpful response or offer tips from your own experience that will help others. Join the discussion at League 360! Join the conversation on League360 and post your favorite symphony volunteer stories and moments bewteen April 6-12 to qualify for a complimentary ticket to the Volunteer Hosted Luncheon at this year's Conference. To be eligible for this prize, you must not only join League360, but post bewteen April 6 and 12. You must also be a registered Conference attendee as of April 25 to be eligible to redeem this prize. The Berliner Philharmoniker invites all League members to explore their online concert venue, the Digital Concert Hall, for free. In this virtual concert venue, all concerts are broadcast live and later become available in a video archive. By now, the Digital Concert Hall includes 250 complete concerts with the Berliner Philharmoniker, their chief conductor Sir Simon Rattle, visiting conductors and soloists as well as more than 180 interviews with the Who’s Who of classical music, classical music documentaries and education films. To explore the Digital Concert Hall for free for 48 Hours, just enter FREELEAGUE at http://bph.de/vic00. This offer is valid until July 1, 2014. They are also offering a 20% discount on Digital Concert Hall tickets for all League members. To receive your discount, just enter 20PCTLEAGUE at http://bph.de/vic00 at any time.